For now, both of the humid weather and my work in the office is unbearable as ever, added to that is my insomnia because of the traffic and my after-office house chores as I got home. I just wanted to chill out and relax. Instead of going home after my schedule, I’d rather wander around our neighborhood mall and look for a place to eat. The next day, I went to their website and their offer is still there! 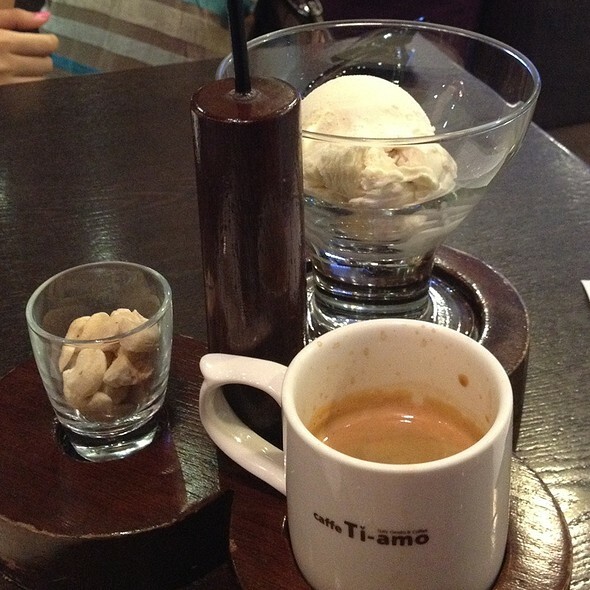 I bought 2 discount coupons for me and went back to Caffe Ti-Amo. The staff helped me with my coupons that I bought earlier from them and bought my much-loved gelato and affogato for such a low price. 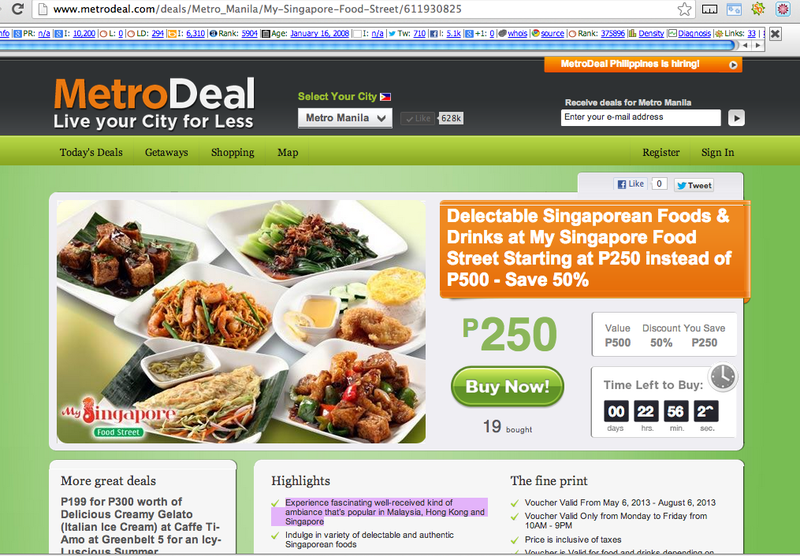 I never thought that I could save so much on my purchase from Metrodeal, oh such joy! While I’m at the Caffe Ti-Amo, I bought my favorite green tea and cheesecake gelato, and their combo was a perfect match. The bitterness of the matcha and the yummyness of the cheesecake compliments each other. I went to finish this one first before having my yummy serving on the affogato. I was delighted as my pre-ordered affogato arrived. Just like my gelato picks, the bitter coffee cream mixed on the vanilla gelato compliments each other very well. It was creamy and refreshing at the same time, that’s why I absolutely love the cool and bittersweet mixes from them. The business economy today has lots of people worried on their alloted budgets. Although it may take time to get rid of money problems, money can still be saved in subtle ways. Discount coupons are a great way to save a lot. The pointers following can help you learn about the best way to use discount vouchers and how they can help you. Use the Internet as a resource to find discount coupons online. 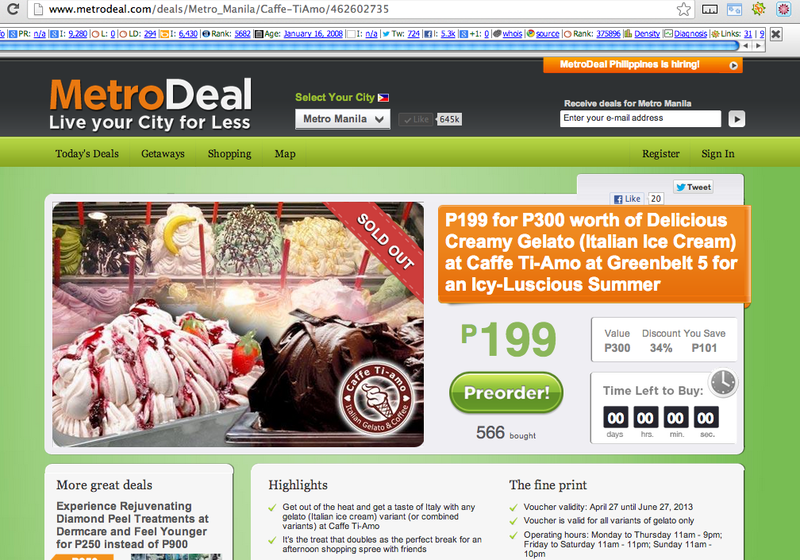 The Internet will give you access to many group buying sites like MetroDeal where you can buy discount coupons and print them right on your printer at the office or at home. Most group buying sites will allow you to buy deals and print several vouchers from their website. These can be used just like any of the discount vouchers you find in other websites. Don’t forget to check the newspaper for updates. The newspaper may contains some deals that you might not be able to find through online sources. It doesn’t take long to determine whether you can use any of these coupons. Don’t get carried away by greed when you are buying discount vouchers. Only buy the things that you can adequately use. If you do not think you can use a coupon in time, or use the deal being bought, you should either give the voucher that you bought online or simply not use it. Sign up for an online forum that lists deals. There are many online deal forums which regularly post freshly posted coupons and promotions that are up online. Not only can you print the coupons, you can also get comments on how well the online coupons worked and whether or not it is a real deal. One great tool for group buying spree is the list down all the vouchers that you’ve bought online on group buying sites like MetroDeal. These list can be a great tool to track down all the deals that you’ve bought on their site, so your discount vouchers will be easy to see, locate and organize. Expiry dates can be viewed in the voucher itself. It can be easily seen, so you’ll not have any concerns using them with you when you avail them. Try to make extra space for saving the coupons that you bought on their site in a clean compartment so that you can get the most out of coupon buying. A 75% discount means that you want to save up as many of them as you can, so have some folders set aside for those items. An excellent method of saving money while buying online is by using discount coupons and vouchers posted on discount coupons sites, like MetroDeal. With any luck, this article can help you know better the use of discount coupons and vouchers better. It isn’t hard to find discounted deals for it can be seen when being searched, and it doesn’t have to be troublesome to put them to use. With little effort you’ll find that you will be saving a lot money anytime. If there was a single appreciate story I prefer to hear over and more than again, it will likely be that of my aunt and uncle. They had been each other’s initially loves, but fell apart immediately after a few years dating one another. Five years passed, and they didn’t hear from one another again. They started seeing other persons, but not a single of them could fill the gap left by their initial love. In time, the two of them met again during a job interview to get a business that they both applied to. Both of them got the job, nevertheless it does not mean that they worked factors out in between them now that they are operating with each other. It even got worst. They were in tight competitors with each other that their supervisor decided to create them operate with each other on one particular project. Forced to perform with one another and with competitors set aside, they began to warm as much as each other and rekindle the old flame involving them. My aunt and uncle got married on the similar year that I was born making this year as their 25th year wedding anniversary. And even immediately after 25 years of continual bickering with one another, it is actually clear to everyone that despite their lots of differences they enjoy one another. To celebrate this memorable occasion, they will be retaking their vows at the exact same church exactly where they got married. They wanted to recreate the occasion down to the last detail that they even scheduled the “wedding” on the same day and hour that it took place 25 years ago. To obtain in addition to the theme, my aunt’s siblings (my mom, incorporated) decided to give gifts which can be the identical or comparable to the ones they gave prior to. My mom gave them a glass bowl set, which broke when my aunt’s home was devastated by the typhoon Ondoy. We had a really hard time looking for a glass bowl set mainly because many of the ones becoming sold in malls cost about Php 500 to 1000. Then I remembered that Metrodeal after had a voucher to get a container set and told my mom that I’ll verify it out before we go obtain the bowl set we found. 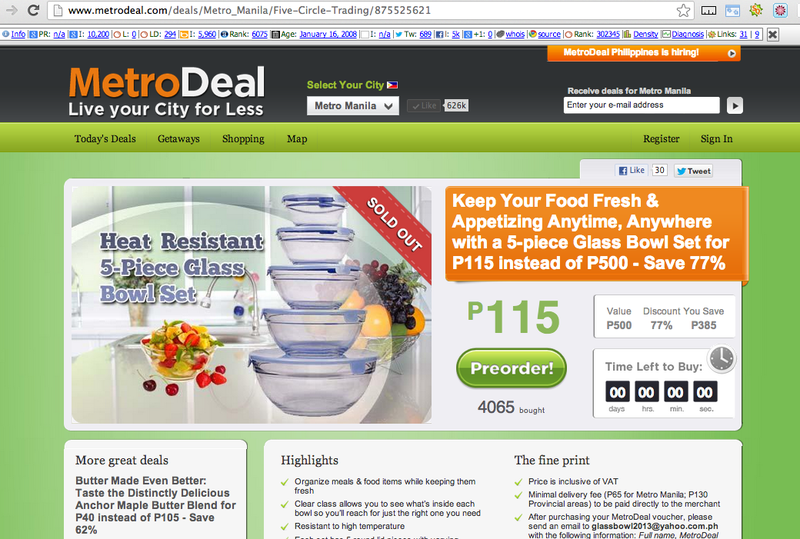 To my luck, Metrodeal had this voucher posted for any 5-piece glass bowl set for only Php 115. It was already 77% off from the original value of Php 500, microwavable, and involves covers for every bowl, which also make it handy for storage. My mom agreed to acquire this deal plus the bowls had been delivered to our doorstep. The wedding anniversary was a good results. My aunt and uncle kept laughing once they located out we had purchased the same gifts as was provided to them prior to. It might not be specifically the same item, but it was enough to bring back the excellent memories that every single present represented. At first, I thought of giving them something traditional, like a stuffed toy or a souvenir figurine. But I realized that these kids, though they still act like children, would not appreciate these kinds of gifts anymore. Another good option are books, but I do not know what kind of books they prefer and I might end up buying something that they will never read. These kids would want something more useful. Something that they can use most of the time. And it has to be something that they can use in school too. 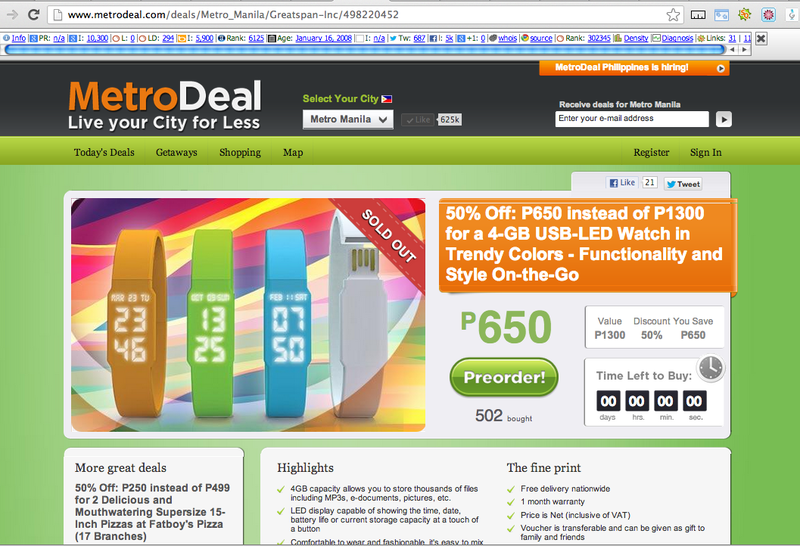 I was running out of thoughts when I saw this voucher in Metrodeal for an LED Watch. Though the watch is a useful accessory, what really caught my eye was how the watch was also a 4 GB USB flash drive. For students, this is something that is really practical and convenient. My students often complain to me about losing their flash drives or forgetting where they left them. Sometimes they even argue with each other because their assignment or project is saved in the USB drive that is currently missing. Because this is a watch, it will be easy to miss in case that it gets left in a computer unit when reporting or in a net shop when printing documents. And since is capable to save 4GB worth of storage, they’d be able to save a lot of their files, from big presentations to small documents, and even music and photos. I’m sure they do have a lot of files to store when they go to college that is why I know they will appreciate this gift. My students might not have made it as salutatorian or valedictorian. They still did their best even though might not have graduated with the highest honors and for that, deserves a reward for their hard work. I know that they will strive to do their best in college, and hopefully, I will get to see them succeed in their chosen careers in the future.